Charles Yu is lonely. More often that not, he’s completely tuned out of reality—usually because he’s set his time machine for Present-Indefinite, which means he cruises about in a box where there is no time. He passes years in what others see as only minutes. A time machine repairman, Charles rescues the clients who, inevitably, have traveled to the past, tried to stay there or change something, and gotten stuck. More therapist than engineer, Charles has to explain why they can’t change their past, why they can’t stay with the ones they love. It’s a question with which Charles is all too familiar, ever since his dad left without a word. His father invented the first time-travel device, but he never stuck around to see how successful it would become; he vanished years ago. Yu thinks he’s out there somewhere, but has never encountered him in the years—or is it days?—at his job. My father thinks success must be in direct proportion to effort exerted. He doesn’t know where or how to exert the least amount for the most gain, doesn’t know where the secret buttons are, the hidden doors, the golden keys. His father worked tirelessly to perfect time travel, but even when he succeeded his optimism was never rewarded. I don’t miss him anymore. Most of the time, anyway. I want to. I wish I could but unfortunately, it’s true: time does heal. It will do so whether you like it or not, and there’s nothing anyone can do about it. If you’re not careful, time will take away everything that ever hurt you, everything you have ever lost, and replace it with knowledge. Time is a machine: it will convert your pain into experience. . . . It will force you to move on and you will not have a choice in the matter. Accompanied only by TAMMY, his operating system and girlfriend of sorts; Ed, his technically imaginary dog; and his memories of building time machines with his dad, Charles searches for his father. 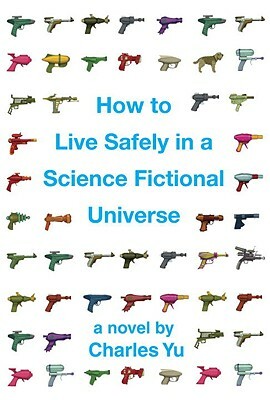 Along the way, he discovers a book, written by himself (a character who is named after the author), titled How to Live Safely in a Science Fictional Universe. This unique tome is being written as Yu narrates the story (and as the reader reads it), but it has already been written many times. As Yu discovers, he is stuck in a time loop that he must escape in order to save himself and his father. Time isn’t an orderly stream. Time isn’t a placid lake recording each of our ripples. Time is viscous. Time is a massive flow. It is a self-healing substance, which is to say, almost everything will be lost. We’re too slight, too inconsequential, despite all our thrashing and swimming and waving our arms about. Time is an ocean of inertia, drowning out the small vibrations, absorbing the slosh and churn, the foam and wash. . . . It was tough for me to truly dive into this book. The science fiction aspects bored me a little, and I grew tired of endless paragraphs on metaphysics and loneliness. The author-as-character-and-book-as-plot aspect got old pretty fast. Perhaps the story is too close to a genre with which I have little experience, or perhaps I’m just not smart enough to truly get what Yu is trying to do: blend literary and science fiction in a fresh way. For me, the book still comes off feeling a little stale.